Preheat oven to 350 F. Mix the graham cracker crumbs, pecans, ginger, cinnamon and butter together and spread in a greased 9 inch pie plate, going up the sides. Bake for 8-10 minutes, until golden. let come to room temperature. In a medium saucepan, mix the peaches, water, balsamic vinegar and honey and cook until peaches are softened, about 15 minutes. Add the ground ginger. The mixture will ressemble chunky applesauce. Cool. If you want to be able to swirl the peaches in a pretty pattern, they should be puréed to a finer consistency. I think mine were a bit too thick to really get them swirled nicely. In your pie crust, spread 1 pint of softened frozen yogurt. Drop dollops of half of the oeaches on this layer and run a knife or skewer though the yogurt to swirl the peaches. Freeze until firm and repeat. Serve the pie with sliced peaches and blueberries. The nutty spiced graham pie shell ready to fill. 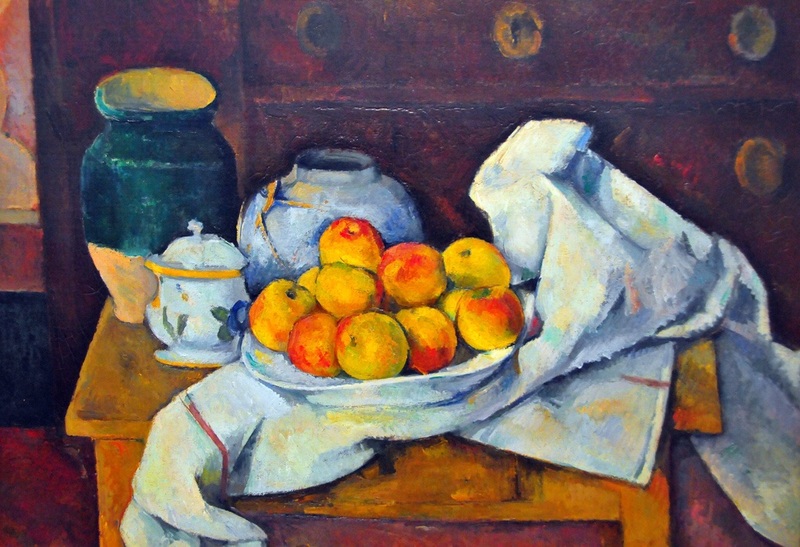 Juicy, ripe white peaches will be turned into a compote. Chopped peaches ready to cook down. First layer of frozen yogurt topped by half of the peach compote. “Swirled” peaches. Umm…use your imagination! The second layer of frozen yogurt and peaches. A better swirled pattern on the top. Sharing a slice of this refreshing pie with the talented bloggers at Fiesta Friday, hosted by Angie@Fiesta Friday.net, Elaine@ Foodbod and jhuls@The Not So Creative Cook. 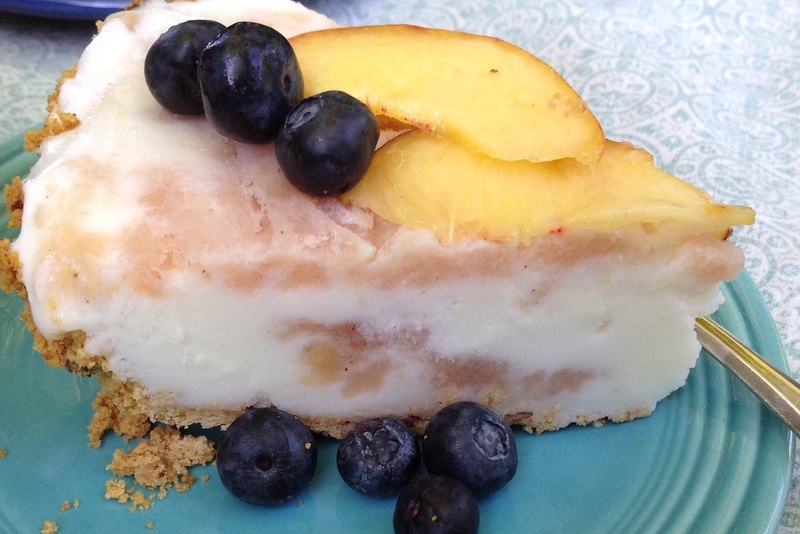 This entry was posted in Recipes and tagged frozen yogurt peach pie, low fat frozen yogurt peach pie by Johanne Lamarche. Bookmark the permalink. ‘Tis the season! Thank you Indu. Beautiful pie! I love that you added pecans to the crust! Thank you Mimi! 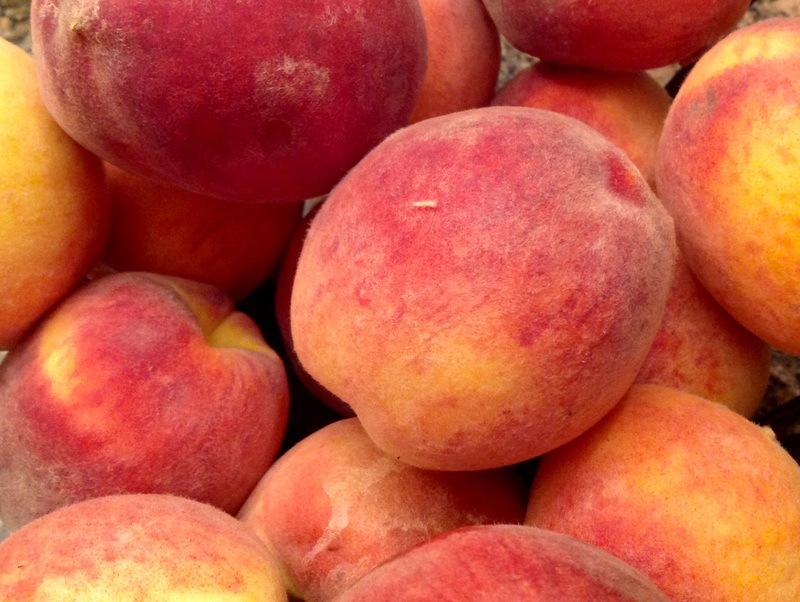 The pecans complimented the peaches well and I loved the extra crunch. Oh Loretta! I have been thinking of you everyday for the past week as I went back to update every post I’ve ever written!!! Almost done but back at Rehoboth Beach taking a break 🙂 peach pie was really good with the balsamic I’m counting on you to make it pretty now! Johanne this pie has my name all over it! I am just peach obsessed. They are so delicious right now, and we always use frozen yogurt instead of full fat ice cream. Little Sebastian is just a doll! I would definitely keep him in peaches! Here is Sébastien in real time! Still loving peaches and especially in a pie! And I know how much he’d love a peach pie made with your expert crust!!! Have a lovely weekend Julie! wonderful dessert, and that quote of Alice Walker’s —wow—that is one to commit to memory. Thanks, Johanne. Thank you Nancy. I’m so happy that quote resonated with you as well. If you ever make the pie and suceed in getting a better swirly pattern with the peach purée, send me a picture! 🙂 have a lovely weekend. Looks tasty! 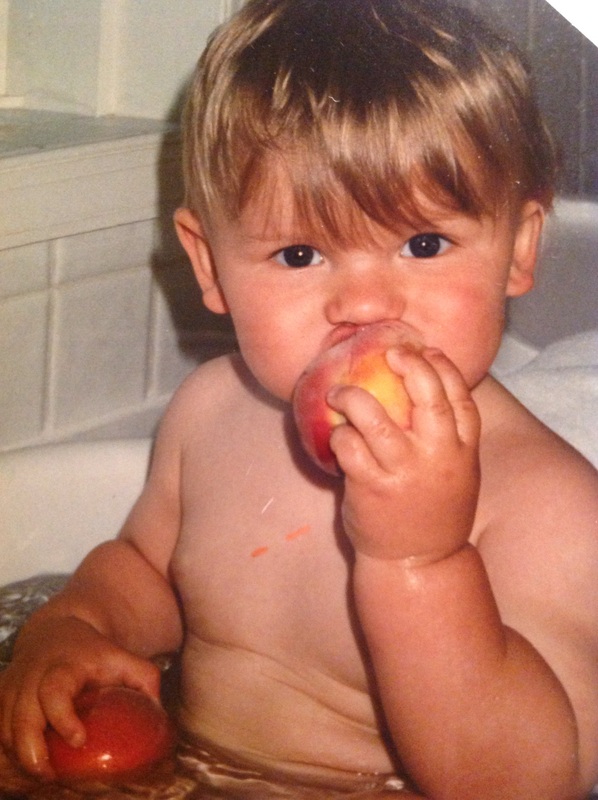 I do love peaches as well, and my son has finally remembered that he likes them too – I think being frozen into a kind of ‘ice cream’ he’d love them even more! Thanks Jhuls! And appreciate you hosting us!!! Enjoy your weekend. 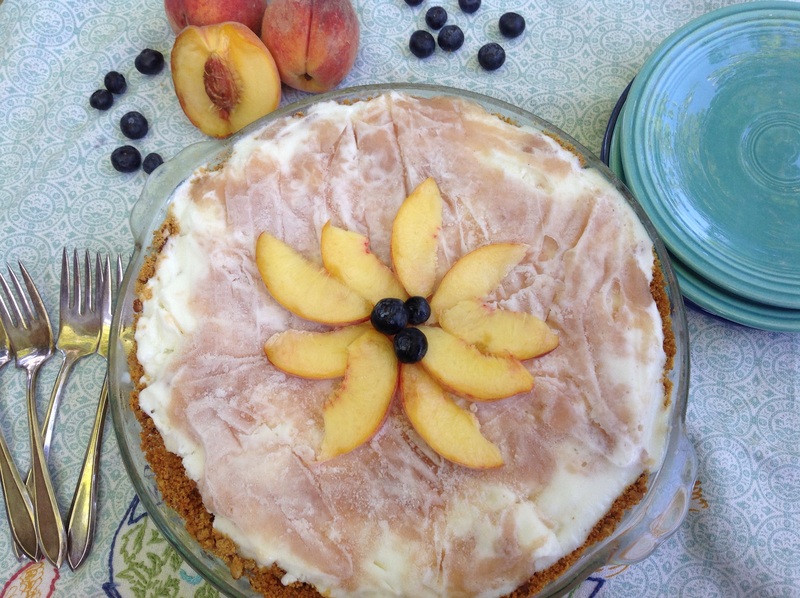 Great pie for a frozen dessert Johanne – I need to make something before the peaches are gone! Thank you Judi! Had a sliced peach with my morning oatmeal in the garden. Gotta get as many peaches while we can:-) Have a great week. This sounds delicious Johanne… seriously thinking of going to buy some peaches tomorrow so I can make it as soon as possible 🙂 Yum! Thanks for this recipe! I’m delighted Lili! Now I know this pie will also become as pretty as it should have been under your expert hands! Please share a picture if you do make it. I think my peach coulis was a bit too thick to really swirl it. Gorgeous Lili! I found your Instagram page.